The Seven Network is producing its own program on the 1997 death of Joe Cinque in consultation with Cinque’s killer, Anu Singh, according to the co-writer/director of a new film adaptation of Helen Garner’s award-winning book Joe Cinque’s Consolation. 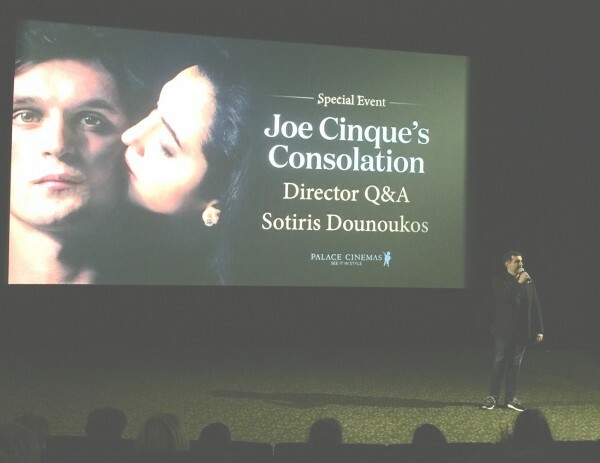 Canberra-raised Sotiris Dounoukis, who was, like Ms Singh, a law student at the ANU at the time of the Dickson killing, told audiences at the premiere of the film at Palace Electric last night that the Seven Network production had already begun filming around Canberra. Asked why he hadn’t consulted with Ms Singh, who served time for the manslaughter of Cinque, during the making of the film, Mr Dounoukos noted that she will have an opportunity to influence the Seven production. “She’s commented a lot,” Mr Dounoukos said. “We thought about it. She chose not to speak to Helen [Garner]. She chose not to give evidence, to be cross-examined [during the court case], and those two things really are a big defining factor in how we approached the book. We embrace it. Joe’s not here to tell his story. Joe Cinque’s parents assisted Mr Dounoukos in the making of the film and he says he has a good relationship with them, though he notes they too will be involved in the Seven production. “Channel Seven pounced on them recently, so next year, or sometime, you’re going to have unfortunately the Channel Seven version, bang, bang, bang, which makes me really sad. The cinematography of Mr Dounoukos’s film depicts Canberra as a beautiful city. Even the dialogue is sympathetic to the capital, with one character defending the city vehemently against a detractor who describes it as boring. The implosion of the original Canberra Hospital is used as a motif at several points, drawing on parallels between the two 1997 tragedies in terms of the relationship between spectatorship and being a witness. Mr Dounoukos passes no judgement on the Cinques over their participation in the Seven program. “There’s probably money in that … but I really I hope that they don’t then shut down their relationship with the film, because they really supported it, and me in the freedom that they gave me. Mr Dounoukos said that for many reasons, he could think of better things to do with his time than discussing the period with Ms Singh. Mr Dounoukos said Ms Singh had had ample opportunity to present her take on what happened, and noted the film was not about the inside of each of the characters’ minds. “She’s incredibly unhappy with the film, but so are all of them [those who knew Ms Singh was talking of killing herself and/or Joe Cinque and did not intervene]. It is a challenge making a real life story. I think about their families, and the discomfort of that, but it’s nothing compared with what the Cinques have to go through. 20 years tomorrow. RIP, Joe! So Anu Singh is not happy about not being given the opportunity to tell ‘her side’ of the story in the film. She served four years for killing Joe Cinque, so I think she did OK. If there were extenuating circumstances why weren’t they used at her trial? Joe Cinque can’t tell ‘his’ side of course. I was at the premiere last night too and thought the filmmaker did a fantastic job. “The implosion of the original Canberra Hospital is used as a motif at several points, drawing on parallels between the two 1997 tragedies in terms of the relationship between spectatorship and being a witness.” I did not make that connection whilst watching the movie and had an aha moment reading this article. Except for the one audible laugh at the joke about Canberra, I have never been in a cinema which was full, yet so quite. The tension was palpable.